May 14, 2009 (Updated Mar 23, 2015) by Sean Slevin — Intended Audience: General. I am enjoying being back in downtown Harrisonburg. I had lived downtown for several years after college. I have many fond memories of walks around various parts of downtown and the adjoining neighborhoods. So though I don’t live downtown anymore, I am excited about having my office here. One of the fun things about downtown Harrisonburg is the surprising variety of wildlife one might unexpectedly encounter. I remember the first time I saw a muskrat in Blacks Run: It was night and I was walking in between Blacks Run and the Water Street parking deck. I looked down into the creek in response to hearing a splash and thought at first that I was seeing a huge (as in, its body alone appeared to be about a foot long) sewer rat! Yuck! Days or weeks later I saw one in the daylight and realized that it must be a muskrat (in the daylight it looked more like a beaver with a rat tail). I discovered that there were two of them, and they were quite fun to watch. It is funny how some things can seem ugly at first glance and then much nicer later. A lot of life can be like that. I guess I could be considered a “casual birdwatcher”. 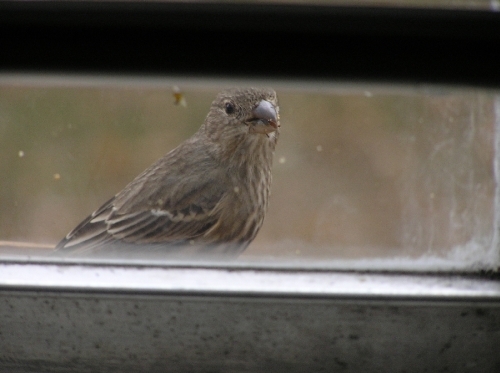 Birds can be very cute in their mannerisms and apparent personalities. When I lived downtown before I always enjoyed seeing the various families of ducks and ducklings making their way around town via the streets and Blacks Run. So I was pretty pleased to discover that there is a pair of ducks (a male and female) that like to hang around my office periodically. 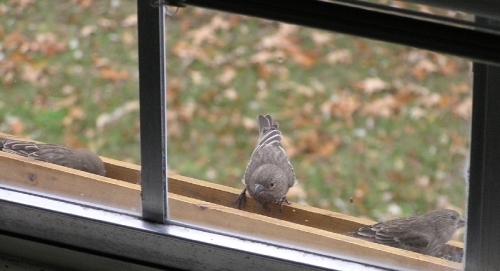 I have held off on posting this blog entry for a week or two because I’ve been hoping to get a good picture of them. But alas, they are not very image conscious (and more importantly, I have not had my camera with me when they’ve been around). 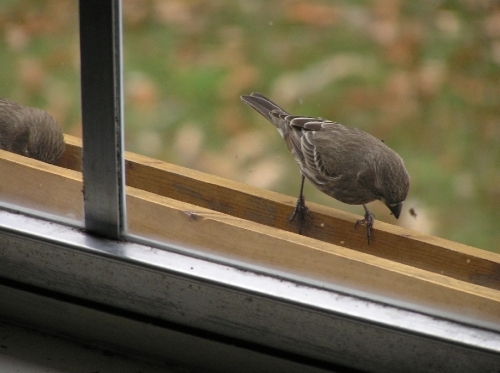 So instead I’m including a few pictures of some finches at the bird feeder I installed on one of my window sills at my prior home in Mississippi (during grad school).